Or… world war I uchrony tank. What if WW I had not finished in 1918 ? If engineers had invented combat walkers instead of tracked-tanks ? From that idea, I ended up modeling this unexpected project. This object is primarily designed in and for Lightwave. The .lws file includes a rig made in genoma. I have added .obj and .fbx versions exported from 3D-Coat also. Version dieselpunkttank_001 is in one layer only and dedicated to the rigged scene. 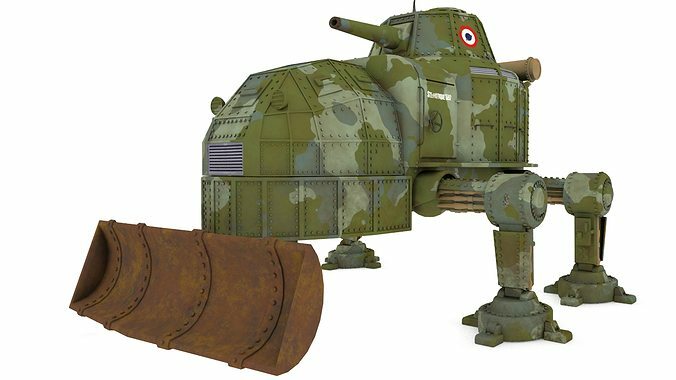 Version dieselpunktank_layered comes in 14 separate layers, pre-parented and with pivots correctly placed for animation or rigging in another app. As a final note : normal maps in Lightwave are applied nodally. If you load the lightwave object in another app, you will have to re-apply the normal maps manually.